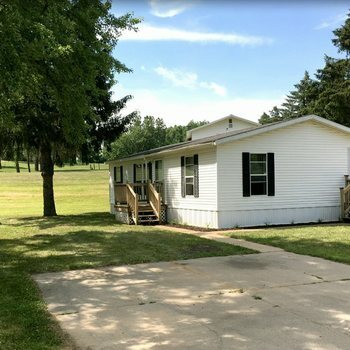 Starlight Mobile Home Park is located at 7175 Bishop Rd, in Brighton, Michigan just south of the Lee Road exit off US-23. 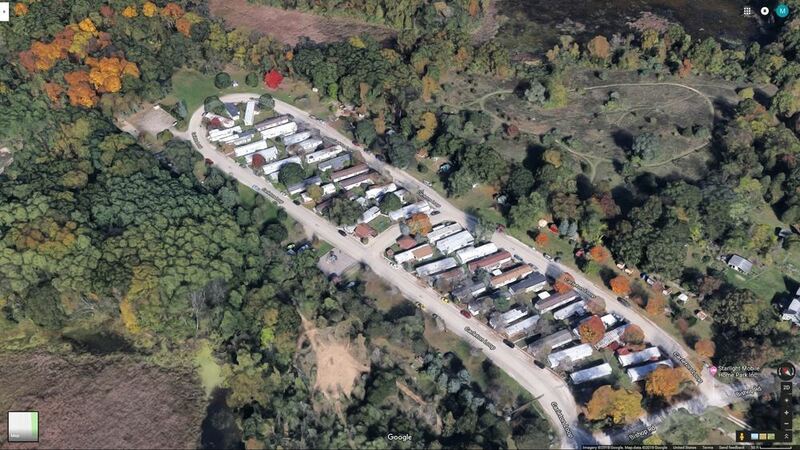 Starlight is a very quiet Mobile Home Park with many retirees and longtime tenants. The property is bordered by protected woodlands to the West and Island Lake State Recreation Area to the North and East. Starlight was developed in 1957 and has been held in the same family since. 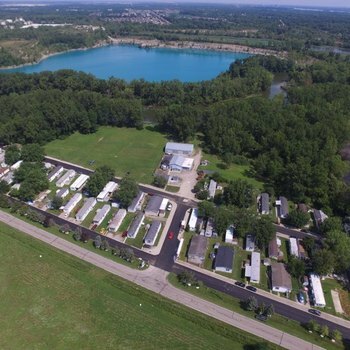 The site encompasses approximately 10 acres consisting of 48 existing pads with 30 owned single-wide two-and three-bedroom homes, and 18 tenant-owned homes. The property features two unit types; 16 single-wide two bedroom/one bathroom homes and 14 singe-wide three bedroom/two bathroom homes. The utility breakdown of this property includes tenant-paid electric while water and sewer are the responsibility of the Landlord, currently serviced by a septic field and well. Starlight offers a significant value-add opportunity with the possible expansion of approximately 32 additional pad sites along the perimeter of the property (as shown on aerial below). For additional information regarding the possibility of expansion within the existing zoning of RMH please refer to the complete Green Oak Township Zoning Ordinance Click Here. The property possesses significant redevelopment potential for townhomes or condos given the strong demographics and household income of the US-23 corridor between Ann Arbor and Brighton. There is tap-in infrastructure at the entrance of the community, enabling a developer to convert water/sewer systems upon redevelopment. The City of Brighton is a suburb of Metro Detroit located in the southeast portion of Livingston County, Michigan, with a population of 7,440 (according to the 2016 census). The median income for a household in Brighton is $59,972, and the median income for a family was an impressive $77,105. 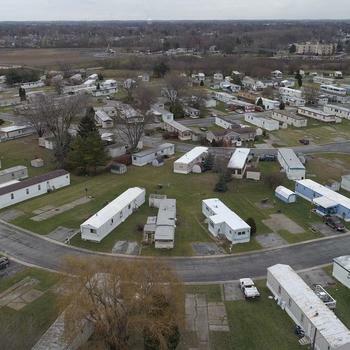 Brighton's surrounding townships and communities, such as Brighton and Genoa Township, have median household incomes in excess of $90,000, making it one of the more affluent places in Michigan. In fact, Brighton was voted one of the 2018 Best Places to Live in Livingston County. The Brighton School District is award-winning and boasts five elementary schools, two middle schools, and one high school with outstanding academic and sports programs. Brighton also has an active Community Education Program that uses school district facilities for many adult and youth recreation programs. Downtown Brighton, only three miles from Starlight Mobile Home Park, offers a great variety of shopping, dining and entertainment options. The Brighton area is home to many different forms of art and entertainment; performances include orchestras, choirs, plays, ballets and local bands. Free summer concerts are held in the gazebo at the Mill Pond each year and many local pubs offer live music as well throughout the spring, summer and fall. For those interested in fine art, Brighton offers the annual Fine Art & Acoustic Music Festival which is now in its 34th year! Although the city is has grown in recent years, it has not lost its friendly small-town feel; residents can expect warm and welcoming people, and the downtown area is easily walkable. Even closer, at only one mile away, is the Green Oak Village Place, a life-style shopping center that includes T.J. Maxx, Home Goods, J.C. Penney, DSW, Buffalo Wild Wings and Panera. Costco, Kohl’s and more are located across the expressway from Green Oak Village Place. Brighton also offers many opportunities for outdoor activities, as it is close to several metro parks. The city gives easy access to major freeways including US-23, and I-96; it is approximately 19 miles North of Ann Arbor, and 17 miles West of Novi. Investors should take note of this excellent location and its many amenities.